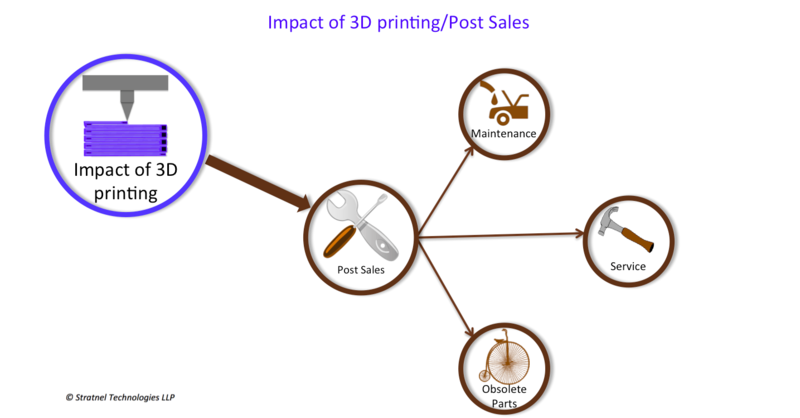 3D printing helps post sales efforts to a great extent. The level of spares that is required for maintenance and service can be lower with 3D printing. This helps companies to save costs. 3D printing helps in maintenance of in-house spares. Spares for existing machinery can be difficult to find due to long lead times or excessive costs. It is always possible to 3D print such devices. This ensures that production does not stop for want of spares. This is important from a logistics point of view. Customers do not like to keep waiting for supplies. An uninterrupted production helps in maintaining the supply chain. Many major manufacturers are using 3D printing for printing out spare parts. This is more prevalent in the after-sales markets. 3D printing helps such manufacturers to assure spare part availability at short notice. It also helps them to keep inventory levels low. The funds saved from inventory can be useful to other critical areas of the business. This is one of the major advantages of manufacturers. Some customers may have older product models which need spares. It is possible to 3D print spare parts of older models from design drawings. This ensures the integrity of the part. Customers will feel happy that their investments last longer.